Journalists at the Chicago Tribune want a union. And they want it fast. Less than two weeks after editorial employees at the newspaper told management they are preparing to organize, staffers took another big step toward forming a union on Tuesday, hand delivering a letter to Tribune publisher Bruce Dold to announce that more than 85 percent of staffers have signed cards in support of the effort. Those staffers are seeking voluntary recognition of the union from Tribune management, and have asked for a response by 11 a.m. on Wednesday. Absent voluntary recognition, the staffers will then move to schedule an election with the National Labor Relations Board. "Voluntary recognition would allow us to begin contract negotiations, saving the company the cost and inconvenience of a campaign and an election that will result overwhelmingly in our favor," the organizing committee of the Chicago Tribune Guild said in the letter to Dold. Charlie Johnson, a homepage editor for the Tribune and one of the leading organizers for the union effort, told CNN that the interaction with Dold was "very cordial." The mood in the newsroom has been overwhelmingly positive, he said. "I see a lot of smiles," Johnson said in a phone interview on Tuesday. It won't be entirely Dold's call to make. The Tribune is owned by Tronc, one of the largest newspaper publishers in the country that has been mired in turmoil and internal controversies for the last year. Last month, the company's chairman Michael Ferro abruptly stepped down after just two years on the job amid allegations of inappropriate behavior. Earlier this month, Ferro sold his stake in Tronc to McCormick Media. Related: What went wrong at the Los Angeles Times? Tronc's stewardship of one of its other papers, the Los Angeles Times, has also been a source of negative headlines. Staffers there bristled under Ferro appointees like Lewis D'Vorkin, whose turbulent tenure as the paper's editor-in-chief came to an end after only four months when he stepped down in January. Distrust with management was a major impetus for Times staffers to organize their own union, an effort that was vigorously opposed by Tronc. The company did not give voluntary recognition to the Times union, which won resounding approval in an NLRB vote earlier this year. Will the Tribune union drive follow the same script? In a statement, Dold said management is "reviewing the request of the Chicago Tribune Guild." 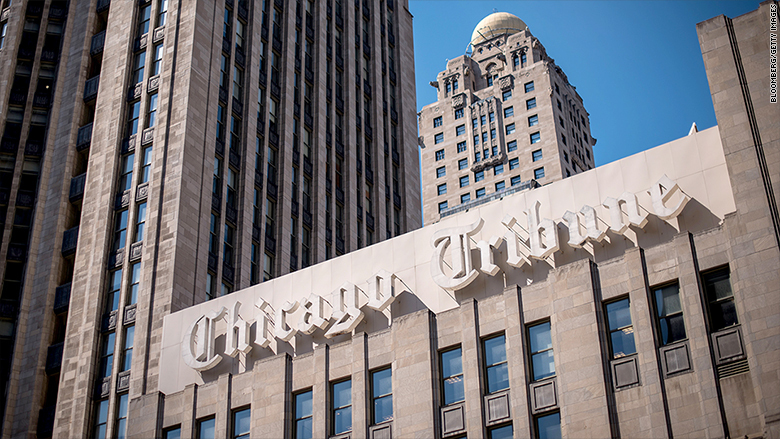 "We believe we can best build on the Chicago Tribune heritage and trust with readers by working together as an organization," he said. "We will continue to work toward our common goal of ensuring that the Chicago Tribune is a leading source for news and information, whatever the outcome." The union would cover around 300 employees in the Tribune newsroom, as well as staffers working at six other smaller Tronc-owned publications in the Chicago area. The Tribune has a longstanding anti-union streak, but the paper -- like much of print media -- has battled financial cuts and layoffs. Johnson said he's hopeful that management will "do the right thing" and recognize the Tribune union, but he isn't sure what to expect. "The thing is, I honestly couldn't tell you what Tronc management thinks because Tronc management does not communicate with its rank-and-file journalists very much at all," he said.